Daniel Ricciardo. Photo: Mark Thompson/ Getty Images. 1. US just slapped China with tariffs on $65 billion worth of goods, a move that could eventually trigger a trade war. The Chinese government has threatened to retaliate and the news riled global markets. The Dow Jones industrial average dropped more than 3% – or 744 points – at one point. 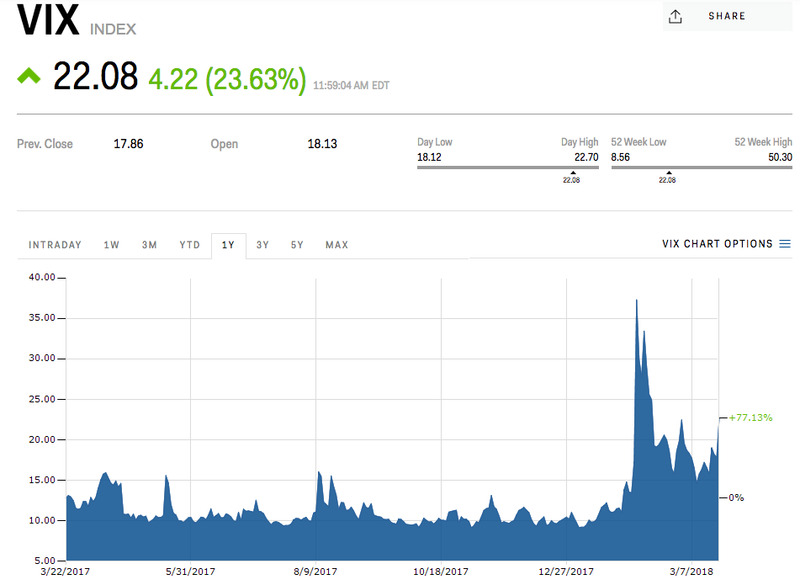 It also sent the CBOE Volatility Index (also known as the “Fear Index”) soaring, up more than 20% to a reading of 22. 2. The Australian dollar has fallen heavily, giving back all of Wednesday’s gains. A combination of heightened trade tensions between the US and China, along with lower commodity prices and a surprise lift in Australian unemployment, explained the Aussie’s slide. The AUD/USD is now back above the 77 cent level less that 24 hours after it was threatening to break above 78 cents. 3. Facebook is exhibiting signs of “systemic mismanagement,” according to Brian Wieser, a senior analyst at Pivotal Research. His note to investors warns that the slew of recent concerns may stem from “operational problems” at Facebook. Moreover, while most other analysts continue to rate Facebook as a “buy,” Wieser has rated its stock as “sell.” Facebook’s stock dropped 9.5% over Monday and Tuesday, wiping out around $65 billion off the company’s market capitalisation. 4. 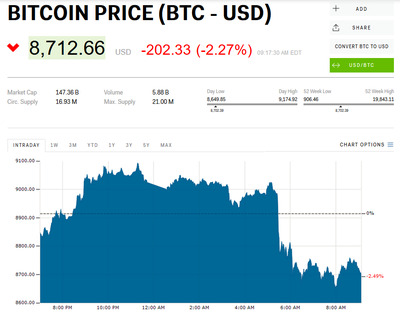 Bitcoin is sliding amid fears that regulators in Japan might tell one cryptocurrency exchange to cease its operations in the country. The digital currency fell approximately $US200 early Thursday morning. At last check, bitcoin was trading in the red, down 3.1% at $US8,635, according to Markets Insider data. 5. ICYMI: Australian employment increased for a 17th consecutive month in February, driven by a 64,900 surge in full-time employment. However, unemployment and underutilisation both increased, creating doubt about whether wage growth will continue to improve in the quarters ahead. Many economists suggest strong population growth and Australians returning to the workforce is making it difficult to reduce unemployment by any significant amount. Here’s what Australia’s economic community made of the report. 6. Turnbull is closing in on company tax deal. The Turnbull government hopes to close the deal on its company tax cuts as early as Monday next week after Pauline Hanson pledged the support of the three One Nation Senators. The government needs nine of the 11 Senate crossbenchers to pass legislation for the remainder of its $65 billion package. Turnbull will likely spend the weekend negotiating with independent Senators Derryn Hinch and Tim Storer to get it across the line. 7. That’s not a movie. That’s a movie. Steven Spielberg said in a recent interview that movies released by streaming services like Netflix and Amazon should not qualify for the Academy Awards and instead said that a film released by such companies should be considered a “TV movie” worthy of “an Emmy, but not an Oscar.” He’s concerned that the rise of streaming services “a clear and present danger to filmgoers”. 9. F1 driver Daniel Ricciardo has sold his Aston Martin. Ricciardo is back home this week for this Sunday’s Australian Grand Prix and last night sold his Aston Martin V8 Vantage S Red Bull Racing special edition roadster to raise money for charity. The The car featuring his siganture went under the hammer in Melbourne at an event hosted by the Aussie racing star, selling for $270,000, with the $100,000 above the reserve going to the Racing for MNDi Foundation. 10. The Aussies are making a comeback. Australian fast bowler Pat Cummins has helped to propel Australia into a position of power on day one of the third Test at Cape Town. South Africa were at 2-220 before Cummins annihilated South Africa’s middle-order 4-7 from 38 balls to perhaps change course of the match. The Proteas lost 6-37 to be 8-266 when bad light ended play with opening batsman Dean Elgar unbeaten on 121 and Kagiso Rabada alongside him on six.